Energy Minister says Israel must carry out an agreement with non-Orthodox movements and expand Kotel's mixed-gender prayer pavilion. Energy Minister and close Netanyahu confidant Yuval Steinitz (Likud) called for Israel to implement the Western Wall Compromise it had hatched out with non-Orthodox groups. 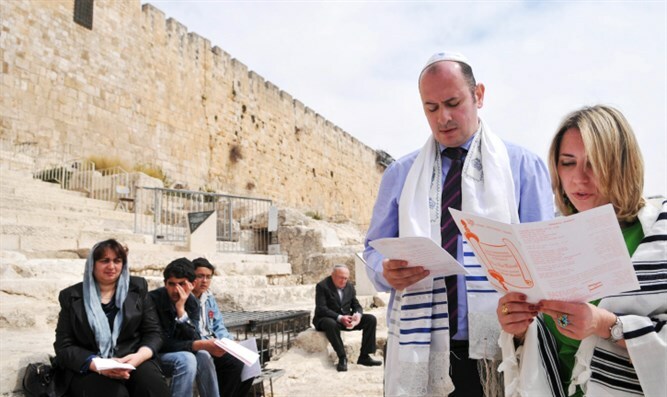 Steinitz's remarks come as the Ministerial Committee on Archaeological Sites met on Sunday to approve the beginning of expansion work at the Western Wall's non-Orthodox prayer space. The meeting took place after both Justice Minister Shaked and Culture Minister Miri Regev resigned from the committee, leaving the planned renovations in doubt. "I think we made a mistake when we canceled the Western Wall layout a few years ago. I was the only one who warned that this would be a mortal blow to our connection with Diaspora Jewry," Steinitz told Radio 103FM. "In the media debate, we dealt with the sanctity of the Western Wall, claiming that we respect the Reform and Conservative movements, but not the Western Wall," added Steinitz, noting that "the same argument that could have been said about Jerusalem, which means that it is impossible for the Conservative and Reform movements to establish synagogues in the city." When queried to why the Western Wall is run according to the Orthodox tradition, Steinitz explained that "I have no problem with the Orthodox Wall, but it is a problem with the fact that we are preventing Reform and Conservative Jews from praying in it." The ill-fated Western Wall plan would have altered the layout of the Western Wall Plaza and granted tacit recognition of the Reform Movement at the holy site. The plan was suspended last year, before being officially canceled in January and has become a major point of contention between disapora Jewry and Israel.